A Pius Man is out. You'd think that would be part of my bad habit of understatements. Nope. 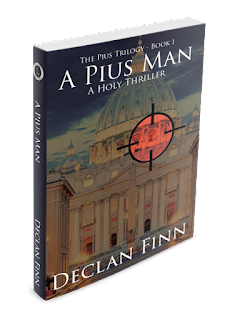 There are actually people who have not heard about the release of A Pius Man: A Holy Thriller. Strange but true. Sadly, I'm too tired to spam the entire internet. Anyway, as of right now, I have only 37 reviews for A Pius Man. "Only?" says the average human being. "Isn't that a lot? The book only came out 11 days ago." Well, when you consider that I had 35 reviews that were ported over from the original release, no, not really. Also, Amazon doesn't start helping you with your book until you get 50 reviews. Which means, though, that all I need are 13 reviews. So, if you've read the book, and you haven't left a review yet, now would be a good time. In fact, one of the things I should probably do is highlight some of the reviews I've already got. Then there's David Halliqust, on Amazon. It starts off running: with a terrible multiple murder to cover up a discovery that could shift the world. In the next pages, Finn brings in the Italian Police, Vatican security, and intelligence agencies from the USA, Germany, Israel, Egypt as well as a cell of old school Cold War ex-Soviets. Even with all of these trained operators and high-tech weaponry, it's the ever twisting mystery that unfolds that holds you though the book and keeps the pages turning. The action is well done, thought out, and moves with violent speed across the pages. So, if this sounds interesting, by all means, give it a go. Thanks.